In 2003, Marc de Ruiter was working on agriculture projects in a poor area of Shanxi Province when he was shocked to hear of small-scale dairy farmers dumping their milk in streets and fields. The milk market was saturated at that time but de Ruiter, an agricultural scientist, decided the milk shouldn't go to waste, nor should people's lives. "I decided to make cheese in 2003 due to the hardship dairy farmers were facing," the 43-year-old entrepreneur said in an interview with Shanghai Daily. After all, Europeans had been making cheese for centuries and the town of Gouda in the Netherlands is the birthplace of Gouda cheese. 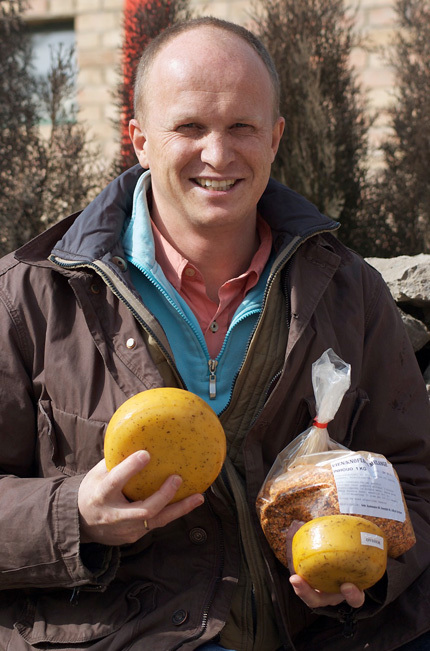 Today de Ruiter runs Yellow Valley Farmhouse in Huangzhai, north of the Shanxi Province's capital city Taiyuan, and turns out handmade, fair trade, organic (he prefers the word natural) Gouda cheese in various flavors. Gouda is a mild, creamy, versatile cheese that is adaptable to the Chinese market. The yellow cheese wheels are a common sight in selected supermarkets and retail outlets in Shanghai and other cities. The milk is free of antibiotics, growth hormones and pesticides. De Ruiter calls it the first farmhouse artisan cheese in China and it might well be one of world's only natural artisan cheeses that is also fair trade. Yellow Valley provides jobs to around 40 diary farmers and 16 other employees; they have benefits virtually unheard of in rural China. The name Yellow Valley comes from the Yellow River that runs through the province, considered one of the cradles of Chinese civilization. De Ruiter, who is fluent in Mandarin, has spent 13 years in China, 10 of them in Shanxi, and he is a familiar figure bicycling around town in Yangqu County. His wife Petra helps train local medical practitioners in midwifery skills. They have two teenage daughters, Elise and Laura, who attend international school in Taiyuan. "My wife and I decided to take the leap and give up our jobs to do what we wanted to do: stand up for those who are marginalized and for small-scale farmers," de Ruiter said. "Also, a strong motivator for working in China and with disadvantaged small farmers comes from my Christian world view and my compassion for the poorer people," he said. After studying Mandarin in Tianjing for three years, de Ruiter moved to Shanxi 10 years ago and worked on various agricultural projects, including improved vegetable raising and pig raising. Yellow Valley cheese is the product of painstaking work with local dairy farmers to produce high-quality milk. In 2003 de Ruiter started a pilot cheese making project and after overcoming a number of bureaucratic hurdles built the cheese production facility in 2007. As a fair trade company, Yellow Valley pays its dairy farmers as much as 20 percent above the market rate to encourage them to maintain food safety and not cut corners. It also guarantees a minimum price for their milk. The farmers now earn about 800-1,500 yuan (US$121-228) a month more than they would get from selling to others, he said. "If you then consider that the average capita annual income is less than 2,000 yuan in our county, one can see we are making a substantial contribution to the economy in general and to the farmers in particular." In the long term, giving people a stable price and a good price is the best way forward for the dairy industry, de Ruiter said. "Only if you have a secure market are you, as a farmer, willing to invest in your business, adopt new technologies and focus on quality." But it hasn't been easy for the new cheese maker. The company was hit by tough food safety regulations for the Olympic Games shortly after making its first foray into the Beijing market in 2008. Then it was hit by the fallout from the melamine milk scandal, in which unscrupulous Chinese milk producers used toxic melamine in milk to falsify higher protein levels. More than 300,000 babies across China fell ill and six infants died from drinking contaminated milk products. The dairy industry virtually came to a standstill for much of late 2008, and small companies like de Ruiter's struggled to stay afloat. It wasn't until 2009 that he was able to market his gourmet range of all-natural cheeses. "I have always dreamed of coming to the developing world to help like this but I never thought that I would be running a business in China after 10 years," he says. "All my previous projects had been in an NGO setting but slowly I have realized that for long term sustainability I think business development with small scale farmers is a far better way."